What is the Legal Definition of Insanity? In California, as is in many other jurisdictions, a defendant is legally insane only if he suffers from a mental disease or defect such that at the time of the commission of the offense he was unable to understand the nature and quality of his acts, or he was unable to understand that what he was doing was wrong. According to one local Long Beach Criminal Attorney, ten states have eliminated the “cognitive incapacity” alternative of the M’Naghten test, allowing an insanity defense only for defendants who are incapable of understanding that their actions were wrong (“moral incapacity”). Some states supplement M’Naghten with an “irresistible impulse” test. The irresistible impulse defense is available when the accused’s mind has become so impaired by disease that he is totally deprived of the mental power to control or restrain his criminal act; Under many state laws in for defendant to be considered “legally insane” the jury must find that the defendant (a) did not know the nature and quality of the act, or (b) did not know that it was wrong, or (c) was incapable of preventing himself from committing it). A number of jurisdictions, Long Beach notwithstanding, have adopted the Model Penal Code test for criminal insanity form, under which a person is not responsible for his criminal conduct if, at the time of such conduct, as a result of mental disease or defect, he lacked substantial capacity either to appreciate the criminality or wrongfulness of his conduct, or to conform his conduct to the requirements of law. Special thanks to Matthew Ruff, Criminal Attorney in Long Beach. How Does Long Beach Court Handle a Bench Warrant? A bench warrant is one that is issued by a judge on the bench, usually when a person does not appear in Court. A commonly asked question is how do you clear a bench warrant once it has been issued? The first thing that must be asked is whether the warrant is for a felony or a misdemeanor. If it is for a misdemeanor such as DUI or petty theft than a lawyer can show up for the person and have the matter resolved. 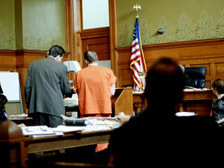 For felonies however, the law requires a personal appearance by the accused in order to clear the court record. According to Matthew Ruff, a Long Beach Criminal Attorney, the Judge will often look to the person’s record of failures to appear in order to decide whether bail will be set. if the individual has no prior FTA’s on their DMV record than the Court will likely recall and quash the warrant. Thereafter the case can be set for a trial or some sort of pretrial hearing in order to work out a deal on the case. However, in some instances if the case is extremely old the attorney may be able to get the charges dismissed based on a denial of the defendant’s right to speedy prosecution. This type of legal motion is very complex and a lawyer should be contacted to discuss the nuances of the case. The daughter of the late Natalie Wood and actor Robert Wagner, has been arrested for drug possession after police responded to a domestic disturbance at her home in Los Angeles this week. The middle-aged Wood who was just a child when her famous mother drowned on a weekend trip to Catalina Island in California — was taken into custody last Sunday at her Malibu home when officers responded to a call that a woman at the home was screaming and there was gun shots. Courtney was arrested on suspicion of felony drug possession for reportedly having cocaine and heroin. The other person involved, an unidentified male, was also arrested for negligent discharge of a firearm. She was released after she posted bail. So what lies ahead for the woman? When she goes to Court she will likely be offered drug diversion which would keep her out of jail.